Kingston SDC4/8GB 8GB microSDHC Class 4 Flash Card. 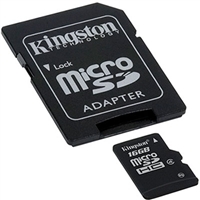 Kingston SDC4/16GB 16GB microSDHC Class 4 Flash Card. Kingston SDCS/16GB 16GB Canvas Select Class 10 microSDHC Card with SD Adapter with Speeds up to 80MB/s read. Kingston SDCS/32GB 32GB Canvas Select Class 10 microSDHC Card with SD Adapter with Speeds up to 80MB/s read. 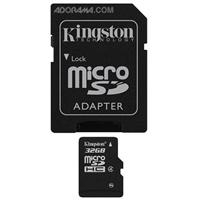 Kingston SDC4/32GB 32GB microSDHC Class 4 Flash Card. Kingston SDCA10/32GB 32GB microSDHC Class 10 UHS-I 90MB/s read 45MB/s write + SD Adapter. Kingston SDCS/64GB 64GB Canvas Select Class 10 microSDHC Card with SD Adapter with Speeds up to 80MB/s read. Kingston SDCA10/64GB 64GB microSDHC Class 10 UHS-I 90MB/s read 45MB/s write + SD Adapter. Kingston SDCS/128GB 128GB Canvas Select Class 10 microSDHC Card with SD Adapter with Speeds up to 80MB/s read. Kingston SDCS/256GB 256GB Canvas Select Class 10 microSDHC Card with SD Adapter with Speeds up to 80MB/s read.